The idea of cliffhangers in business content always seemed weird to me. Isn’t business writing too serious for that? Business content aims to educate, market, and sell. We’re not writing a Netflix blockbuster. But I have to admit I was wrong. A cliffhanger adds a touch of drama, and that tiny bit of drama makes even serious business content more engaging. This works for blog posts, and even for sales pages. Wanna keep busy readers hooked to your words? Drama keeps readers spellbound because they want to know what’s happening next. Will the detective find the murderer? Will the shy youngster find love? Who will win this fight? In fiction, drama can get quite complicated. You need characters that readers can empathize with and root for. You need a plot with twists and turns, so readers stay eager to learn more. In business writing, we don’t need too many complications. 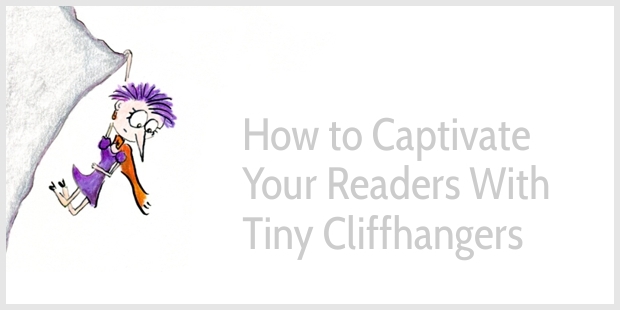 We only need one-sentence cliffhangers to keep readers captivated for a few more paragraphs. Michael Connelly is a bestselling crime writer, known for his series about detective Harry Bosch. He’s also written court room dramas about Mickey Haller, Harry’s half-brother and a defense attorney. Little did I know how important this witness’s testimony would become. This sentence immediately makes the reader curious: Why is this testimony important? What will it reveal? Sometimes the wheels of justice roll smoothly. The second day of trial started exactly as scheduled. This sentence makes readers curious as they suspect the second day of trial may not end smoothly. What will happen? It was this stack of correspondence that I was most interested in, and it was here that I found the document that would change the course of the case. Readers want to find out what this document is, and how it changes the course of the case. This curiosity keeps them reading for a few more pages. We can use the same principle to arouse curiosity in business content and keep our readers captivated for a few more paragraphs—no matter whether we’re writing business stories, blog posts, or sales copy. Mike Sager is an award-winning journalist, who wants to empower creatives to pursue and profit from their work. His blog posts on 99U.com are a mix of education, inspiration, and a large dose of personal storytelling. This is a story about the day I quit writing. On its own, this sentence might not make us curious, but we know this post is about writer’s block, and this context makes this sentence fascinating. Why did he quit writing? And how did he get started again? Can I learn something from what the author went through? I don’t recommend writing a long opening sentence because they’re hard to pull off and keep readers engaged, but Sager immediately got me: How did he became an artist at the age of only 13? And why was he in this dangerous situation? And what has the tear gas to do with being an artist? These questions keep me reading on. In the context of reinvention, this sentence raises questions: Why did his student get fired? What did Sager tell him to do? And how did that help him reinvent his creative career? One-sentence cliffhangers raise questions. These questions make readers curious, and that’s how you can keep them hanging on to your words. This also works in educational material. In educational material, the reader is the hero, and the writer is his guide. The reader is struggling with a problem or dreaming of a better life, and the writer tells him how to get there, how to defeat his demons, and how to achieve his goals. The drama in educational material is about this tension between what is and what could be. The one-sentence cliffhanger is like a promise of what could be. The idea that visual thinking could solve the problem of distraction is intriguing. What are these visual tools? And how do they help? When these questions resonate with readers, they’ll keep reading on because they want to know the answers. Again, for the right readers, this is intriguing: How did I shorten my writing time? Why are these tricks crazy and counter-intuitive? To keep business readers captivated, create a sense of mystery or promise them a solution to their problems. I signed up for the Enchanting Copywriting Course wishing to renew our hopelessly outdated website text. For someone who’s by no stretch of the imagination a copywriter, this was a daunting task. For readers considering joining this course, this sentence is intriguing. Did the course help make the daunting task doable? Did this participant get rid of her hopelessly outdated website? Was she able to learn how to write copy? And frankly, I wasn’t sure I could afford it. This sentence refers to a common hesitation about joining courses because spending money is a risk: Is it worth my investment? Will I really learn something valuable? Will I have the time to commit to this course? Your best sales people are the people who have hired you and enjoyed your service. They can tell the best stories. They can write the best sales copy for you. 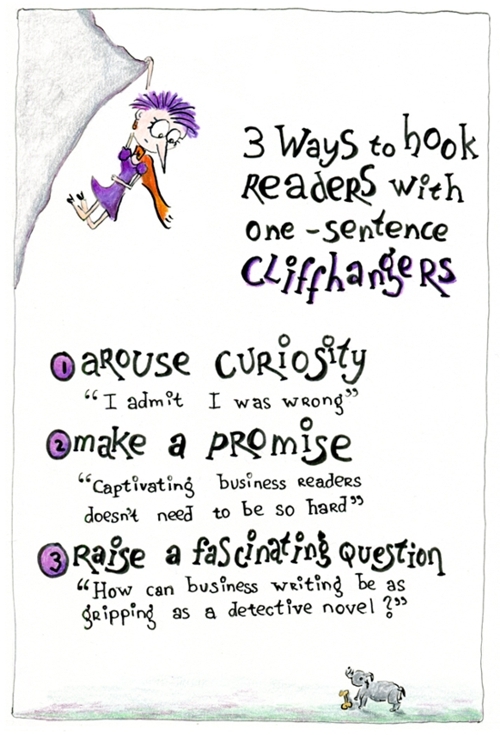 Their one-sentence cliffhangers hook potential customers as they become eager to learn more. These one-sentence cliffhangers in the testimonials work best when they tap into a wish, fear, frustration, or doubt other potential customers recognize. Let’s not add more fluff to this giant echo chamber. How could you keep her captivated? What would make her curious to learn more? When you keep readers spellbound for a blog post, they get addicted to your writing, and they’re bound to come back for more. And when you hook them with your sales copy, too, making money becomes a whole lot easier. No pushiness required. Thanks for bringing this topic up! While I was reading your words, I realized how blurry it is sometimes the line between personal and business writing. I always thought the same with social media, because people want to see the real you, including the jokes as much as the success stories. I guess is the same with business writing, we are all curious about the real story and a little bit of drama. Is there any brand you consider successful in this skill? I’m not sure I have an answer to that. I see brands as entities; at best they derive their personality from individuals working for a company (but quite often a brand personality is artificially constructed by marketers). I like, for instance, how Ann Handley, as Chief Content Officer, gives the brand MarketingProfs personality. But writing this seems odd – she has a personality, not the brand, but her personality reflects positively on the brand she works for. Thanks for writing on this. Getting readers’ attention and boosting engagement is as difficult as customer retention in the product industry. Being a blogger I know that I lose my readers when I write in-depth content but I think with your trick, with cliffhangers (I am surprised that we can use them in how-to style posts which is so great! ), and questions. Thanks for giving us a great tip every week. I am lucky to have discovered your blog and being a reader of it. Yes, and getting attention is one thing, keeping it a whole different matter. And this can be especially difficult if you write long, in-depth content—in such a case, it’s useful to keep reminding readers why they’re reading this specific piece of content (how will they benefit), and include cliffhangers a few times. Happy writing, Swadhin, and thank you for stopping by again. Great article, Henneke, and the drawing was spot on! Loved it. I am skimming more and more articles these days because they aren’t engaging, so your advice on how to keep your reader’s curiosity aroused to read the next sentence or paragraph is even more important than ever! I’m the same. I skim a lot of content and quite often can’t be tempted to start reading. I guess sometimes it’s because I’m not the target audience, but quite often content feels too fluffy or too superficial. I’m too impatient! As I read this, I kept visualizing my favourite authors and how they keep me hooked in their stories and I realise that I need to do more with incorporating this technique in my writing. Thanks for the reminder Henneke. Always a pleasure reading your posts. That’s exactly what I do to improve my writing, too—try to understand why I like stories and how others tell them. Happy writing, Yvette, and thank you for stopping by! Henneke, your posts are the cliffhangers to great reading. I so love how you make business communication more fun. This is a great idea, which I will steal…er…put to good use. 😉 Thanks! Thank you reading, sharing, and for stopping by again. I appreciate it, Cathy. Two years after taking your copywriting course, I am still getting full support from your teachings day after day. Your recommendations are always in my mind whenever I start to write on anything from social media to my website and even to personal notes. I like the “purity” of your writing style which is so hard to find. Thanks for being such an extraordinary instructor, Henneke. What a lovely comment! I’m glad my recommendations are still keeping you company. Thanks as always for the inspiration from fiction, I’m going to hunt down Michael Connelly now and read his novels! It has taken me quite a while to see how I can implement fiction writing tools in business writing. But I’m finding it fun to look for similarities and trying out techniques. By the way, I prefer the Connelly’s Harry Bosch (named after the Dutch painter Hieronymus Bosch!) rather than the Mickey Haller series. It seems so obvious when you point it out (using fiction techniques in business writing) but of course it’s not obvious, or we’d all be doing it anyway! I’ll definitely try out the Harry Bosch series first :). Let me know how you get on with Harry? I agree with you, Heidi. The magic in creativity often happens when we steal from different formats. Happy writing! Thank you so much for stopping by. I hope you’re week is going well, too. I think I just did this thing the other day…. In my most recent newsletter, I told the story of how my coaching partner and I started working together. I likened it to proposing marriage…. And the tension of whether someone would say yes or no? You have done it again. One of the most powerful things I have read to day. I hope someone or something does the same for you. I know it sounds cliche but you are a blessing may your well of knowledge, wisdom, and understanding never run dry. Thank you so much for your lovely comment. I get inspired by a lot of different people (and books!). It’s wonderful to be at the receiving end of enchanting marketing emails again. Have just finished book revision after six months, and your content is as inspiring as ever! Congratulations for finishing you book revision, Helen! I clicked on the link to your post about writing faster, thinking I remembered it from long, long ago, only to realize it was only a couple of months ago that I’d commented on it. Is it possible to be too busy to write, too busy to take the necessary steps, too busy to devote oneself to best practices? If so, that is just too busy. Yet, I can remember writing until 2am daily to produce some of the best work in my past. So now, I find all writing impossible. No matter when, no matter the circumstances, even, I’m not capturing my thoughts and not writing anything that could even be call editable. But I will. Somehow. I hope. Yes, I definitely think it’s possible to be too busy to write. I find one of the challenges with writing is that it’s not just about the time we sit at our desk trying to write. We also need time to think and let ideas percolate. When life is too busy, then often this percolation time suffers. We don’t have enough time to let our mind wander and daydream, and then our writing suffers. I’ve also found, when I force myself to write when am actually too tired, then I produce crappy content and it takes a huge amount of time to revise it. When I write when I’m reasonably alert, then I can produce a decent first draft. I also think you probably know more than enough about best practices already, so don’t worry too much about it! I hope you get your mojo back soon, Katharine. I appreciate your making time to stop by and leave a comment. Henneke, I hope I will always find, steal, or make time to visit here. I appreciate your support, Katharine. Henneke–Great explanation of cliffhangers, I kept visualizing my favourite authors and how they keep me hooked in their stories and I realise that I need to do more with incorporating this technique in my writing. Thanks Henneke. Thank you so much, May Xonghoi. That’s exactly how I improve my writing, too … analyze how others write, especially my favorite authors. Loved. Absolutely loved this post! Thank you. You actually gave me an idea to improve the copy on my writer’s website. One of my clients gave me a testimonial that’s the perfect cliffhanger. That makes me happy, Nick. There’s no bigger compliment than using my tips 🙂 Happy writing!